I'm not normally one for making resolutions at the start of a new year because why kick them off when the calendar happens to change over and not just at any other time when you want to do things differently? However, towards the end of 2017 I decided I want to have more of a focus in my life on kindness, positivity and thoughtfulness (opposed to getting stuck on negative feelings and bad things that happen). And then I saw my friend Laura's excellent reading resolutions blog post (make sure to check it out!) and it sparked some more ideas of my own that I'd like to pursue this year. 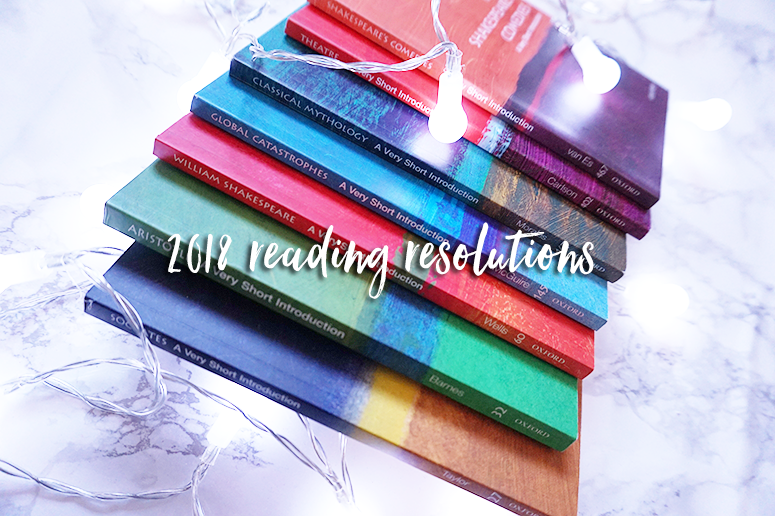 So suddenly I do have resolutions; from reading less (yes really) to returning to old favourites, here are my bookish goals for 2018. This may seems like a very strange one to start with – especially for a book blogger – but hear me out. For years I've been focused on reading more and reading all of the review books I receive in the post and in 2017 it just became too much. No longer was I reading 130+ books a year but even reading nearly 100 (which was my Goodreads reading challenge and I am very competitive, even with myself) became a struggle and sucked the joy out the books I was racing through. Not only that, but if I didn't pen a review down quick enough thoughts about one book would seep into the next and it would all just became a big blur of pages and words that became forgetful rather than memorable. This year I want to focus on quality over quantity, enjoyment over challenge. I might not read 2-3 books a week any longer, heck I may even struggle to hit an average of 1 a week, but I need to remind myself that that's okay because I can focus more on each individual book I do read and I get far more value and enjoyment out of each one. I grew up reading classics such as Tom Sawyer, Little Women, Treasure Island and Dr Jekyll and Mr Hyde, and they are what sparked my love for reading. So why have I not read anything but new releases for years? One reason is of course that review books are almost always new publications and I have felt obliged to read those first and foremost if I am fortunate enough to receive a pre-publication copy. While I'm going to continue to review books as I love discovering new voices and reads before they're mainstream and supporting the titles and authors along the way, I also want to go back to my roots. Over the Christmas break I browsed lots of book websites for gorgeous editions of timeless classics as I love myself a pretty design, and by collecting these titles I'm hoping I'll vary up my reading experience again, reading a book from the 21st century one day and one from the 19th century another. Editions I'm particularly keen on collecting include the Barnes & Noble Leatherbound Classics, Puffin in Bloom, Virago Modern Classics, Folio Society and the V&A Collector's Editions. If you too want to read more classics or just love a snazzy cover, check out my wish list for some beautiful editions you too might want to add to your collection! I'm going to sound a little like a broken record here but because I've always been so focused on reading the majority of the books I'm lucky enough to receive for review, everything else is pushed to the background and I hardly have time to read books I get gifted or buy for myself, or even to reread old favourites. In 2016 I reread all of the Harry Potter books in the lead up to the Fantastic Beasts and Where to Find Them film release and I got such a huge amount of joy out of surrounding myself with the familiar characters and places I grew up with. It felt as comforting as going home to spend time with my family and the back-to-back reread also provided me with additional insights into the story I missed the first time around (because while I've reread the earlier books in the series aplenty, I never did reread the final instalment). I've been meaning to reread other old favourites for ages too, such as Station Eleven by Emily St. John Mandel, Sophie's World by Jostein Gaarder and Crusade in Jeans by Thea Beckman, and this year I'm going to set some precious reading time aside to actually do this. I already can't wait! I go through phases of genres I devour. I went from fantasy and dystopian young adult at the start of my book blogging career in 2010 to women's fiction and romance, to contemporary YA and popular reads, and finally non-fiction last year. I now read quite a mixture of genres (though a large portion is still YA, general fiction and non-fiction) but it's non-fiction especially that I've 'discovered' as a diverse and fascinating genre that really fits where I am in my life right now. I started out reading lifestyle inspirational books such as The Little Book of Hygge and The Little Book of Lykke, but I've also become very invested in educational reads, especially the Very Short Introduction To series from Oxford Press and wildlife titles (the latter sparked by devouring Planet Earth II and Blue Planet II on BBC, not going to lie). I also want to pick up more travel guides again in 2018 (I'd especially like to dig deep into my Banff & Jasper Lonely Planet) hoping it will inspire some exciting outdoors adventures in the near future too. 5. Attack my TBR... vigorously! And these are my reading resolutions for 2018. Do they align with some of your own bookish goals for the year? I'd love to read yours too so do leave them in the comments below! You have great resolutions! Good luck. Good luck with your resolutions, and Happy New Year! Good luck with them, Zarina!